With December fast approaching, most of us will start to notice Christmas lights and decorations popping up here, there and everywhere. But if you’re a dog owner, those festive decorations can become something of a dilemma for both you and your four-legged friend. So it’s important to always have your pet in mind when planning how to make your home more festive. There are many potential hazards that are easily forgotten when it comes to decorating the house for Christmas. You might not realise it, but many seemingly innocent Christmas decorations can pose a threat to dogs. For example, Christmas trees are treated with chemicals to make them last longer and snow globes contain antifreeze, both of which can be dangerous to a dog’s health. However, with a few simple precautions, both you and your dog can enjoy a happy holiday season. Choosing a Christmas tree suitable for dogs can be a minefield, as both real and artificial trees have their pros and cons. The chemicals sprayed on real trees can filter down into the water which comes from them. Should a dog lick the tree, or consume any of the water, they could become ill very quickly. The easiest solution to this problem is to ensure a fabric skirt is placed at the base of real trees. This will restrict a dog’s access to the tree stand or pot, which is where water tends to collect. It’s also important to regularly sweep up excess pine needles. Artificial trees are generally the safer option, as long as you choose one without artificial snow. Some of the products used to make this snow contain chemicals which can be harmful to your dog. Whether you choose an artificial tree or a real one, you should always aim to anchor it to the wall or ceiling to stop it from falling over, should any paws attempt to give it a push. 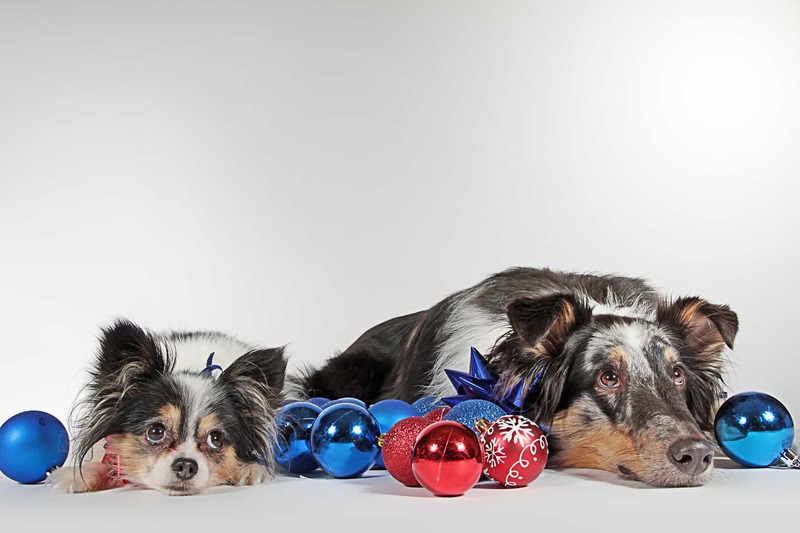 There are many other simple steps you can take to keep your decorations dog friendly. Training your dog to respond to drop and leave objects will come in handy if your pet’s curiosity spikes. Make sure you reward your pet for complying with commands, as positive reinforcement is the best way to show them that they have done the right thing. Although everyone loves the sparkle tinsel can bring to a tree, it is one of the most dangerous decorations for dogs. Even a couple of eaten strands of tinsel can lead to surgery, as they can become wrapped around the dog’s intestine. Consider using tinsel sparingly and at a safe height away from paws. But if you want to eliminate the tinsel risk completely, don’t use it at all! For further information about Oscar & Hooch products, please call +44 (0)1934 713667, or email enquiries@oscarandhooch.com.